This past Sunday, was the 29th Sunday in Ordinary Time in the Christian Calendar. 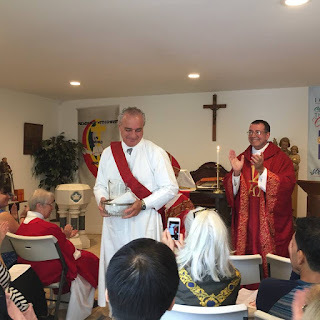 I celebrated Mass with my White Roman Clerical Collar on. However, it was anything but an ordinary time. The Mass was the ancient Catholic Rite ordaining one to the Diaconate, a call to serve your fellow humans in the most humbling way. A call to wash the feet of those in need, those who are broken, who are in the margins, those who have sinned and hope to find forgiveness, redemption, and salvation. The place was Saint Joseph Mission Church, the newest addition to the United State Old Catholic Church movement. A part or level of Catholic tradition (there are three; Roman, Old, and Orthodox), that differs only in the doctrine of fallibility of Papal authority. Meaning, we believe that everyone is capable of making a mistake, even the Pope. The newest Deacon was my classmate from Union Theological Seminary in the City of New York, Jeff Grant. The Presiding Bishop Edmund Cass, would lay hands on Jeff, as he lies facedown prostrate upon the cold stone floor in front of the Altar. I, a Priest now for only over a year, after the having completed 7 years of seminary training and formation, would assist in the miracle happening in a church full of friends, family, and believers. I would swing the heavy brass Censer with the gothic aroma of frankincense smoke billowing to the heavens over the Altar, the Bishop, and my friend Jeff, who was in deep prayer and I am sure reflection on the ritual that was happening before us all and hoping God is calling him to do something great. Seminary much later in life. We both had major careers before that, advanced degrees, and reached the pinnacle of success. Both of us focused our life work within the Criminal Justice System, Jeff a prominent Attorney, and myself a beat cop that rose to the top as Sheriff of one of the largest counties in New Jersey. Also, we both share another common event, we both made one small mistake in our lives, and because of that mistake found ourselves on the opposite side on the Criminal Justice System. We are among the nearly 70 million people in America who find themselves sentenced to life as convicted criminals and are forever changed, stigmatized, and often shunned. Both Jeff and I now, nearly 16 years later, have come to see and recognize the great challenges, problems, and most of all the tremendous inequity that is within the criminal justice, the correctional system and even the system of organized religion. The need for criminal justice reform and even religious reform on every level is long overdue. We need only turn on the nightly news to see the great divide between police, clergy and community. Not upper middle class communities, but communities of color, the inequity and mistreatment of women, Latinos, LGBTQ, those with special needs, and all other minorities being “not” represented in the Criminal Justice System or being treated more harshly within the walls of our overcrowded and differential correctional institutions, or being left out or denied access to practices of faith, worship, and liturgy. I do believe that most cops and clergy go to work every day, trying to make the world better. But I also believe that reform, more education, and sensitivity training are long overdue. I also believe, that we as a society need to recognize the need for reform of ourselves, to be better than we are, to be more forgiving, more understanding, and more than we can even expect from ourselves. The United States Old Catholic Church and the Saint Joseph Mission is a call to share the Gospel with ALL people, to affirm and celebrate our diversity and embrace our difference, and most of all to welcome and forgive those who have fallen, have made a mistake, or who are broken. Our hope, prayer and goal is to not only forgive, but to empower, to raise up, and help those who have fallen to stand tall once again! From this past Sunday in ordinary time, my brother in faith, Rev. Jeff Grant and I will now try to do the extraordinary. We have been given a second chance by God to make the Church, government, and even the police better than they are. Jeff as a lawyer and me as a cop, were once called to save lives, now we are called to save souls. We are being called to help shed light on the darkness that is so prevalent in the world in the mistreatments and lack of fairness that exists in the Church, Criminal Justice and Correctional System. We are going to try to show the importance of giving people a second chance, of offering forgiveness and redemption. In changing that life sentence of stigma and being cast out to a life sentence of service, love, and grace. We are going to try to do the extraordinary. Keep us in your prayers we could use all the help we can get – and if you want to join us, just reach out! Rev. Monsignor Joseph Ciccone, Ed.D., M.Div. Blessed are the Peacemakers who bring GOD to the People!